- D 93488 : "The Richest Duck in the World" (Lo$ #12), from 1994, by Don Rosa. Francis Drake was born in Tavistock, Devon, around 1542, in a very ordinary and devoutly religious family. The family left, and moved to Chatham in Kent where they lived on a ship because there were religious disturbances in Devon. Drake's father became a Protestant preacher. He first started going to sea while living in Chatham. Then, he returned to Devon and sailed with his relative John Hawkins. Together, Hawkins and Drake made the first English slaving voyages, bringing African slaves to work in the 'New World'. He made several voyages to the Caribbean with John Hawkins in the 1560s. Drake attacked Spanish ships, sailing back from their new conquests in South America, which were extremely attractive, as they were laden with silver, and if he was successful in capturing them, took their treasure for himself and for his Queen, Elisabeth I. He was called "El Draque", meaning "The Dragon", by the Spaniards. In 1577, Queen Elizabeth I commissioned three men to sail around the world. On November 15, 1577, under the command of three captains, Sir Francis Drake, John Winter, and Thomas Doughty, the "Queen's Corsair" set sail from Plymouth to the Spanish-controlled Rock of Gibraltar. Originally, the voyage was planned as a raid on Spanish ships and ports. Six ships left Plymouth, with Drake himself sailing in the Pelican. Nearly all the crew thought they were heading for the Mediterranean. One by one, all of the ships were lost, destroyed, or turned back.. By October 1578, as the company started up the western coast of South America, there were just 58 left, all on the Pelican. Drake renamed his ship the Golden Hind. During his voyage, Drake discovered things which helped to give a more accurate picture of the true geography of the world. He discovered that Tierra del Fuego was not part of a southern continent, but a group of islands, which meant that if the American continent was not connected to a southern continent, the Pacific and the Atlantic oceans met at Cape Horn : this was the Cape Horn route, eventually discovered in 1616. As Drake sailed further up the coast, he plundered Spanish ports in Chile and Peru and captured treasure ships. His biggest prize was the Cacafuego. Drake sailed further north along the coast of the Americas than any other European until then. On the way he landed in what is now California, naming it Nova Albion (New England) and claiming it for his queen. He then continued across the Pacific to the East Indies, or Spice Islands. Six tons of cloves were loaded onto the ship. Later, half had to be tossed into the sea in order to free the ship from a reef. His route through the East Indies lay along the uncharted southern coast of Java. Here Drake discovered that Java was an island, not connected to a southern continent as the Dutch believed. When he was back in England, with spices and Spanish silver and treasures, Queen Elizabeth dined on board the Golden Hind at Deptford, on the River Thames, and later knighted him. The king of Spain was insulted by the Queen's reward to Drake. His voyage may have been triumphant to the English, but it was highly destructive to the Spanish. Drake was involved in several other battles with the Spanish. In 1585 he and more than 1000 men attacked Santiago in the Cape Verde islands. As no treasure was found, he ordered the town to be burnt down. In 1586 he captured San Domingo in Hispaniola (now named Haiti).One of his most famous attacks was on Cadiz and Coruna in 1587. In a daring raid, between twenty and thirty ships were sunk or captured. Perhaps of even more importance though, was the destruction of supplies intended for King Philip's planned Spanish Armada. Because of the attack, the Armada was delayed and the Spanish were short of some important supplies for their fleet. They were also forced to use unseasoned wood for barrels, as Drake had destroyed the seasoned wood. Later on this resulted in the rotting of many of their precious stocks of food for the Armada crews. Sir Francis Drake was very active in the Armada battles of 1588. He died from dysentery in January 1596, on his final voyage, off the coast of Panama, in Nombre de Dios Bay. His body was placed inside a lead casket and he was then slipped overboard. First, in "Mystery of the Swamp", his name is evocated while Donald says he'd like to be like adventurers such as Colombus or Drake. Then, the name of Drake, is also evocated in "Donald Mines His Own Business", in which Donald thinks Huey, Dewey and Louie's fake mine map is for real. In "The Ghost of the Grotto", it is said that a long time ago, there was a ship sailing to England, carrying Spanish gold for Queen Elizabeth I, which crashed against the Carribbean reeves. The only survivor, the captain, hid in a cave with the treasure, wainting for Sir Francis Drake. But he didn't come, and when the now old captain thought he wouldn't be able to protect the treasure anymore, he kidnapped a little boy so that he can protect it. This way, every 50 years, the same day, the protector of the treasure was changed , which created a great fear into town. In 1947 (the date of this story), the actual guardian, who thinks Drake is still alive, has to choose his successor and kidnaps Dewey Duck, who is eventually saved by Donald and his brothers. In "Some Heir Over the Rainbow", Scrooge McDuck gives an amount of money to Donald, Huey, Dewey and Louie, and Gladstone, to see how they will use it, and so, which of them would be the best heir. Huey, Dewey and Louie lend the money to an old sailor who has an old Spanish map which showed where a Spanish Galeon which was running away from Drake's fleet hid a treasure. The old man eventually finds the treasure thanks to the money. Sir Francis Drake is also evocated in "Back To Long Ago! 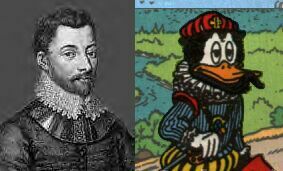 ", where we can see past incarnations of Scrooge McDuck and Donald Duck, Matei McDuck and Pintail Duck (Don Rosa will later show that their are ancestors of them too), two sailors of Queen Elizabeth I who hide a treasure and sail on the ship "The Falcon Rover", which sailed by the Carribean from 1563 to 1564, under the orders of Captain Loyal Hawk. It is said that this ship sunk not far from a desert island in 1564. In "His Majesty, McDuck", we learn thanks to an engraved copper plate found by Scrooge that the land Nova Albion, discovered by Sir Francis Drake on June 17, 1579, is in fact located in Calisota, and that Drake founded here, on a hill (later known as Killmule Hill, and later as Killmotor Hill), his settlement, Drake Borough. In 1818, it is renamed Duckburg by Cornelius Coot. In "The Guardians of the Lost Library", it is said that "El Draque", the spanish name for Sir Francis Drake, stole books which countained a digested version of the Lost Library of Alexandria along with other famous libraries and knowledges, on the "Nuestra Señora" Spanish ship in 1579, under the orders of Queen Elizabeth I, and he hid them under Fort Drake Borough. Pieces of science and history will later be selectionned and put together in a single book for the Queen by Fenton Penworthy, last survivor of Drake Borough, and other men from Drake Borough. It is said that they were waiting for Drake to be back and take the book for the Queen, but that he died in 1596, probably while he was back to take it... This book later became the famous Junior Woodchucks' Guidebook. In "The Richest Duck in the World", he appears in a TV report about the history of Duckburg and of Scrooge McDuck. He also appeared in the unpublished sketches of Don Rosa's "The Last of the Clan McDuck" (Lo$#1), from 1992 (D 91308), which told the history of the Clan McDuck, in which we can see that Malcolm McDuck, an ancestor of Scrooge who is in fact the same character than Matei McDuck, if he isn't the same duck. It is told that Malcolm sailed on the "Falcon Rover" in the 1960's in the Caribbean trade routes, under the captain Loyal Hawk, and later was the first mate on "The Golden Hind", in 1579, on the west coast of America, to claim land for Queen Elizabeth I along with Sir Francis Drake. After Drake Borough was built, Malcolm was left in command of this settlement and Drake went back to England.